When you need an Ultra Reliable Message On Hold player, we are please to offer our DMC and DMD We are pleased to introduce our Fourth Generation Digital Message On Hold devices, with a number of options that have been specifically developed for today's market. Use a conventional SD Flash Card DMC or conventional USB Stick DMD (supplied with your unit), to store the MP3 based Message on Hold production that you will use. Use a separate dedicated MP3 micro-processor which is designed to out Messages of the Highest Quality and can even use MP3 files created at the highest (320kbps) sampling rate possible (Broadcast quality). Use a High Power Amplifier designed to be the ideal solution for Message On Hold applications. Are extremely compact (a little larger than a packet of cigarettes) and weigh less than a standard iPhone. Use a convenient 3.5mm Audio Output (same as an iPhone) and have Keyholes allowing for Quick and Easy 'Secure' Wall Mounting. DMC and DMD can have up to 250 MP3 Files loaded on the Memory Card and they will play each of these files sequentially before returning to the first file once the last file has played. There is NO discernable gap between Messages. Messages start playing as soon as power is connected (9VDC or 9VAC) and will continue with Ultr Reliability until power is disconnected, or if Time Programmed to Stop Play (Models DMC6 and DMD6 only). Should there be an 'unintentional power disruption', they will restart play as soon as power is restored. DMC and DMD can alternativel be with a new 'optional' MESSAGE CHANGE SWITCH. This inexpensive option is designed to allow Users to quickly and Easily Change the On Hold Message that plays. It is ideal for Seasonal/Special Message play, such as during Christmas, Special Occassions, Sales Events etc. With this 'option' Multiple Messages can be loaded onto the Memory Card and the unit will only play the First Message loaded onto the card. The User can then press the Switch when required and it will instruct our unit to play the Second Message only. Each additional press will command the unit to select and play the Next message only. When the Last message is selected, the next press will instruct the unit to play the First message again. The 'inexpensive' Message Change Switch is recessed so that it cannot be accidentally pressed. Models DMC4 and DMD4 are our Standard Message On Hold Players. DMC4 is supplied with an 8GB SD-HC Flash Card Card (or higher). DMD4 is supplied with 8GB USB Stick (or higher). Both players will start playing Messages as soon as the Message Card containing one or more MP3 files is inserted into the SD Card or USB slot loacted at the back of the player. They both utilise our well proven MP3 engine and High Quality Amplifier to provide the ideal solution for Message On Hold applications. DMC5 (or our DMD5 which uses a USB Stick) incorporates all of the new features of our DMC4 device (or our DMD4 which uses a USB Stick) and in addition utilizes our popular message Encryption facility, which means that it will only play Messages that have been Encrypted with our supplied software. It is quick and easy to use! Our Encryption facility is designed to prevent unauthorised use of your valuable productions. To use Encryption, all you need to do is to use our supplied Encryption program. 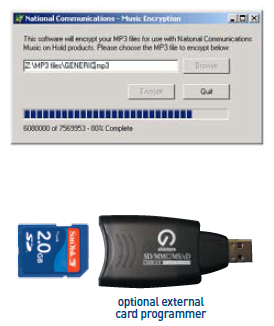 This program will Encrypt a typical MP3 file in less than 15 seconds. Our DMC5 device (or our DMD5 which uses a USB Stick) will only play these Encrypted MP3 files and these files, if copied cannot be used in any device other than a Natcomm Encryption play device. DMC5 (or our DMD5 which uses a USB Stick) is also specifically designed to work with our Email Message Update program. This program simplifies the process of transferring Message update files from your PC to the Flash Card and is ideal for those customers that are not PC experts. Our program performs all of these steps automatically, by simply double clicking the attachment in the email. It also encrypts the file at the same time it saves it to the card. Please see Encryption Facility for more information. Model DMC5 : Encryption based Message On Hold solution, supplied with an 8GB SD-HC Flash Card. Model DMD5 : Encryption based Message On Hold solution, supplied with a 8GB USB Stick. DMC6 (or our DMD6 which uses a USB Stick) incorporates an Intelligent Real Time Clock accessory, which will allow Fully Automatic Time and Date Programmed change of up to 20 Messages that have been loaded onto the SD Flash Card or USB Stick. DMC6 (or DMD6 with a USB Stick) can also be set to stop play at the expiration of a rental contract, ready to start play again after a contract has been renewed. Timetable instructions for DMC6 are quickly and easily set up using our supplied Dealer Control program. Please see Time Programmable Message Play Facility for more information. DMC6 (or DMD6 with a USB Stick) can also incorporate our Encryption Facility at No Extra Charge. Model DMC6: Time Programmable Message On Hold solution, supplied with an 8GB SD-HC Flash Card. Model DMD6: Time Programmable Message On Hold solution, supplied with a 4GB USB Stick. Our DMC Digital Message Centre is an Ultra Reliable, High Audio Quality Message on Hold player for or a PBX Telephone System. DMC plays MP3 files of ANY sampling rate and is available with many options, including the choice of Message Encryption Play, a Manual Message Change Switch so that a User can Manually select and play different Messages as required and also an Intelligent Automatic Time Programmable Message Play facility, where DMC can be programmed to play up to 100 Messages during specific dates, on specific days, between specific times and any combination of these choices. (select a Tick Box if an Option is required). 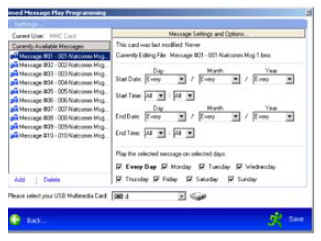 Model DMD is an Ultra Reliable, High Audio Quality Message on Hold player for or a PBX Telephone System. DMD uses an external USB Stick instead of the 'press in - press out' SD card used by Model DMC. It is supplied with a 4GB USB Stick. DMD is also available with a Message Encryption Play option, where only MP3 files Encrypted with our supplied Windows PC Encryption Software will play. This option protects valuable productions from unauthorized copy and use by another device.